Tristram Marine recently held a launch to over 300 industry guests, showcasing their new 701 Offshore and 701 Vanquish. The Hamilton company said they were touched by the turnout of loyal clients and supporters alike. “We are very humbled by the support and passion that each and every one of you show to the Tristram brand. The brand has always had a very strong following, and as a result of last nights release, the strength of the following and the bond between each and every owner and their boats has set a new benchmark in the industry,” said Tristram Fink, marketing manager. The unveiling of the much-anticipated 701 Offshore (hardtop), and the surprise 701 Vanquish (targa top) went well, with orders having been placed for the 701 well in advance during the design process. Primarily designed for the offshore fishing market, yet retaining the family aspects Tristrams are renowned for, the 701 Offshore is the latest addition to Tristram’s range of computer designed (CAD) trailer boats. This design method has been adopted for all recent creations by the team at Tristram, providing unsurpassed accuracy and precision. The 701 Offshore has been designed to meet the demand from customers who have wanted to upgrade to a hardtop model, but have been constrained by shorter garages and lighter vehicles. At 7-metres the 701 Offshore becomes the smallest hardtop model in the Tristram range, joining the highly successful 741 Offshore, 851 Grandeur and 881 Offshore models. Released to the public alongside the all new Tristram 701 Offshore as a surprise new model, the Vanquish now sits in the Tristram range as the largest cabin boat in what is now one of New Zealand’s most diverse trailer boat ranges. The 701 Vanquish shares an outstanding new CAD designed hull with the 701 Offshore. CAD and CNC design and construction are now standard on all new Tristram models, providing unsurpassed accuracy on each and every boat produced. These two new 701′s now bring the Tristram range to an unprecedented and diverse 12 models. See our website for more on the exciting new 701 Offshore and 701 Vanquish. 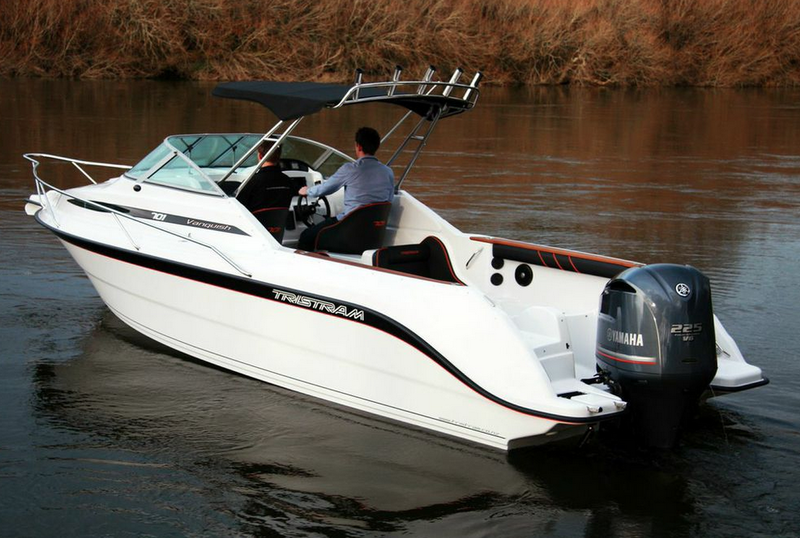 Tristram Marine‘s new models will be on display at the Auckland On Water Boat Show.